Chickens or ducks on the homestead? I have to admit, I am a chicken collector. I also have a love affair with our ducks. We have 3 Pekin, 2 Khaki Campbell and 2 Indian Runner. 2 of them are drakes, or males. They have such a neat personality, are really friendly, and quite entertaining to watch. I would have lots more ducks, but again, my hubby has to have a limit somewhere for our 1/5 acre. 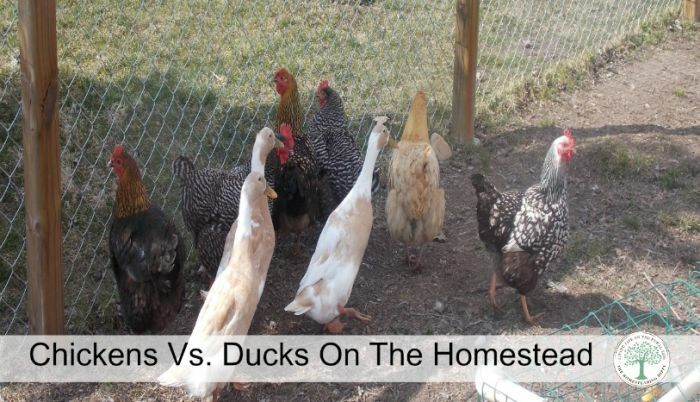 So, which is really better–chickens or ducks? Here’s my pros and cons to each, based on my experiences. Chickens need more daylight hours to lay. That means, when the daylight has less hours in the winter, we either have to supplement their light or we get less eggs. That means more electricity for the light and timer. They eat more in the winter since they are not able to get at bugs and grass, so it becomes a matter of economics. I have never had this issue with ducks. With our 5 ducks, we get 4-5 eggs every day, no matter what season. Of course, chickens will lay their eggs in a nesting box, and our ducks require us to go on a “hunt” to find theirs. I have figured out the places they like the best, but once in a while they change it up on me. Well, that’s up for debate, but chickens require only fresh water, food, and the occasional treat. We have our chickens set up with an automatic feeder and in the summer, the 55 gallon rain barrel feeds into a waterer for them. We could easily leave our chickens for 3-4 days without much issue. Ducks-not so much. They use up a lot more water, and for some reason, whenever their feeder is full, they will eat until it’s gone. Gorge themselves on it. We have to have a trusted friend or neighbor fill their water and/or pool daily (as well as rinse it out) and feed them daily. Well, chickens are noisy at times. When they sing their “egg laying song”, or when they are complaining about something, they can get rather irritating. But, that’s about it. They don’t make a lot of noise otherwise. They are quiet creatures, usually staying within pecking order and happily scratching about and gathering bugs, grass and such when they can. Ducks, however…well, let’s just say that they are not quiet. They will quack in the morning, quack when I fill their pool, quack when it’s time to eat, quack when the wind blows, quack when they see another duck…They are just noisy. Even though the drakes are quacking at a whisper level, they are still making noise. Well, this is where the tables turn dramatically. Our chickens can destroy an entire garden bed with all it’s goodies in less than an hour. One time, our chickens got out of their run while I was at the store, and by the time I got home, all our tomatoes were gone. Our ducks generally don’t mess up the plants. They can destroy the beds that have just been planted by eating the seeds, but once the plants are growing, they have never destroyed it. I can’t really say. In general, ducks are less destructive and lay better in the winter. But, they are far messier and noisier than chickens. Having both is awesome, though and I seem to get the best of both worlds. Perhaps try them both for yourself and see which you like best. Or maybe you’ll be like me and just love them both! I love watching ducks and chickens together!! Better than any tv show!! 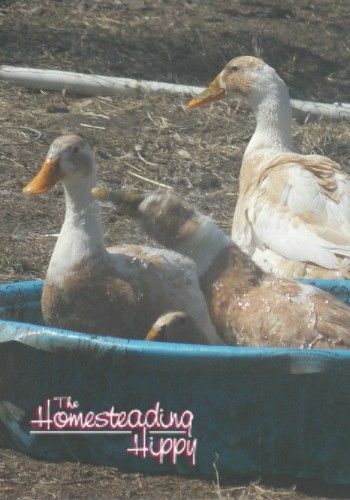 If you’re homesteading – hobby farming – or working the kinks out of your Off Grid Survivalist Redoubt – if you have kids, I think it would be a great idea to raise them with fowl and give them chores on the raising, care and upkeep of them. The kids will name them, have favorites and view them as pets all of which equates to Loving them and wanting to protect and care for them. Kids needs to get dirty, and know what an Earthy Life Style is like. The in-doors, antiseptic- hand sanitizer life of selfies, social media and video games is making kids useless to society. 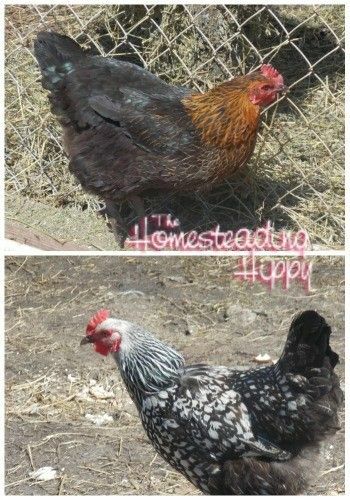 Get them out of the city and onto a homestead! Give them Chores – let them get good and dirty! They’ll love you for it! Thanks for linking up with Green Thumb Thursday. I hope to see you again this week! I agree with Heather, both chickens and ducks have their “pros”. We have a 10 acre farm and we have 5 roosters, so our chickens are just as noisy as the ducks! However, I couldn’t imagine not having them all around. We’ve only had ducks for about a year now, but they added so much to our lives. Ducks are hilarious- they run on a different clock than chickens- they are creatures of habit- & always have to be busy. They love life so much, it gives us a lot of joy to watch them go about their day. Our 12 ducks share a coop with our 20 or so chickens and it is a great arrangement. Every morning we let them all out of the coop to free-range around the property. They’re always happy to see us. They will make a lot of noise & chastise us if we’re late in letting them out. We feed them all a bit of grain, then let them get the rest of their daily requirements themselves. Both chickens & ducks are very curious. They will follow me around on the farm to see what I’m doing, and to see if there’s any handouts to be had. The ducks throw a party every time I refill their kiddie pool or give them new bedding, then it’s on to foraging, then an afternoon nap under the kitchen window. We have a hen who waits for us to open the garage door every morning, so that she can hop into the seat of my gator & lay an egg. Just about dark, the chickens all go back to the coop to roost, while the ducks hunt me down & tell me it’s time for dinner. I call to them “woot woot woot! (Their call before they learned to quack), & they all tumble back into the coop to get a bedtime treat. It works perfectly- the chickens take the upstairs & the high roosts, while the ducks sleep on the floor. They happily sleep in their coop together all night, locked in so that they’re safe, & it all starts over the next morning. The ducks always leave me eggs on the coop floor; chickens in the upper nest boxes. What a wonderful family! !